My husband pestered me for several years about making some tortilla soup for him. I’d never had it, so I wasn’t exactly sure what it should look like or taste like, and I wanted it to be as authentic as possible. I found a slow cooker recipe, but I was afraid that it would turn out too watery or just not taste authentic. So I tried it but made a couple small changes. 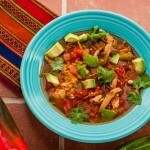 My husband really liked it and said it came in a close second to a good tortilla soup he had in New Mexico. So this one is now a regular for us. You can also make it on the stove (directions below). We like it with chips, guacamole, and a couple Coronas. CHICKEN: Roast two large chicken breasts (boneless skinless) sprinkled with chili powder to taste in a 350° F/175° C oven for about 20-30 minutes. Remove from oven and allow to cool for a few minutes, then shred with a fork. Throw everything except the garnishes in your slow cooker and let it cook on high for 5-6 hours. To serve, pile on the garnishes and give it a squeeze of lime. If you prefer to make this on the stove, saute the garlic and onion in 2 tablespoons olive oil, then add the remaining ingredients. Simmer for at least an hour. You can make this gluten free if you can find a hot pepper sauce that is not vinegar based. 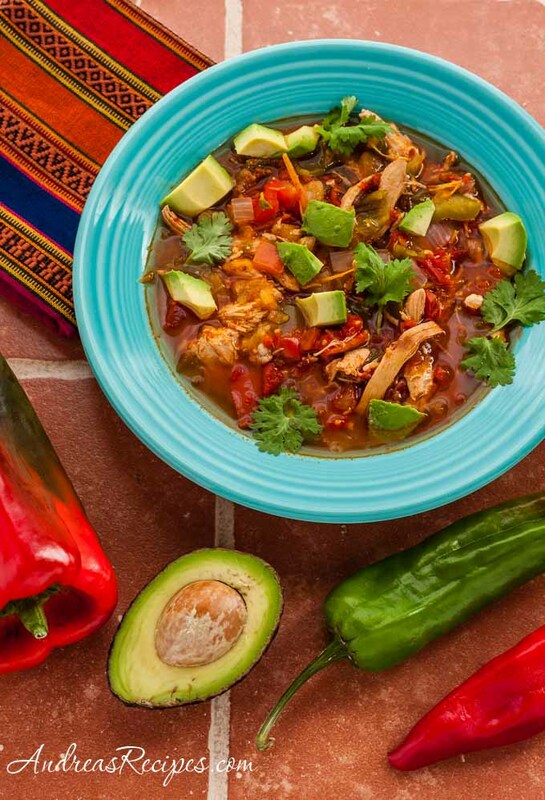 We use Rio Grande Hot Sauce, which has no vinegar, and it works great. Also found a vinegar free sauce by Badia called Louisiana Cajun Chili Pepper Hot Sauce. As her favorite Celiac I can testify that this recipe is delicious 🙂 The gluten free hot sauces are easy to find; I found them at my local grocery store. Be sure your chicken broth is also gluten free. She makes her own broth for this when I’m coming to visit! Hi Kay! We’ve found two so far that are not vinegar-based: Rio Grande Hot Sauce, and Badia brand Louisiana Cajun Chili Pepper Hot Sauce. I’m sure there are others. Hope this helps! YUM! this sounds fantastic. thanks for sharing such a great recipe!